Pinball poster of a backglass detail of Williams' Pin-Bot pinball machine, photographed by Santiago Ciuffo. Design: Python Anghelo, Barry Oursler. Art: Python Anghelo. 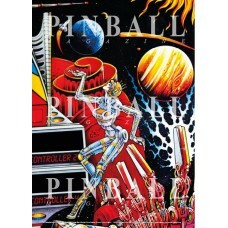 Check out the book PINBALL by Santiago Ciuffo, published by Pinball Magazine. See website for details, reviews, feedback and more.